Today is Election Day in the United States. No matter who wins the vote for President of the United States – though I pray it is Barack Obama – at least it can no longer be George W. Bush. Needless to say, the last eight years under “W” were not the greatest of times – from the 9/11 Attacks in 2001 to the economy being in the worst shape since the Great Depression, to fighting wars in both Afghanistan and Iraq. Anyway, all this hatin’ on George W. Bush got me thinking about his dad, George H.W. Bush, who was President from 1989 to 1992. 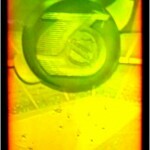 The elder Bush actually appears on a hockey card in the 1991-92 Upper Deck set. Championship teams from all sports are usually invited for a White House visit, and hockey is no exception. 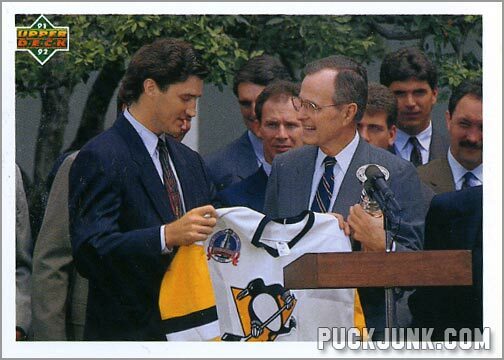 In June 1992, the Penguins got to visit the White House, as chronicled on this trading card. 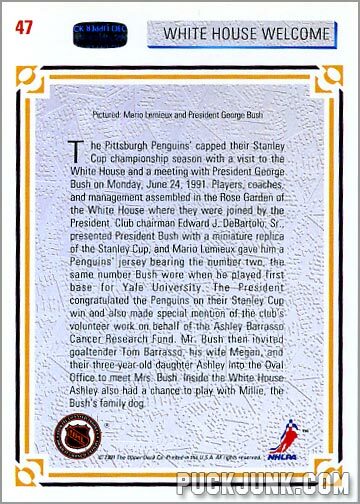 On the front of the card, you see Penguins team captain Mario Lemieux presenting a Pens jersey to a smiling George Bush Sr. 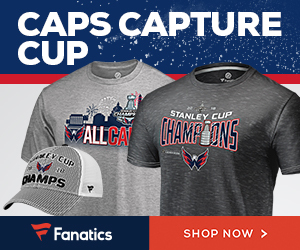 In his left hand, the President is holding a miniature replica of the Stanley Cup. 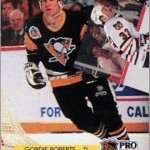 In the background stands Penguins players Joey Mullen, Kevin Stevens and Bryan Trottier among others. I wonder if the writer got paid by the word to pen this utter drivel. I mean, come on! “The President congratulated the Penguins for their Stanley Cup win.” You think?!?! 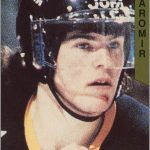 Too bad nothing interesting ever happens during these presidential visits, like Jaromir Jagr being mistaken for a KGB Agent, or the President puking on Phil Bourque during lunch, or Ulf Samuelson suffering a career-ending knee injury while playing horseshoes with the President. 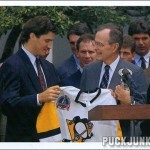 Unfortunately, none of this happened on either of the Penguins two White House visits. Last summer, Topps inserted cards of Presidential Candidates in packs of their baseball cards – but those were insert cards of candidates. 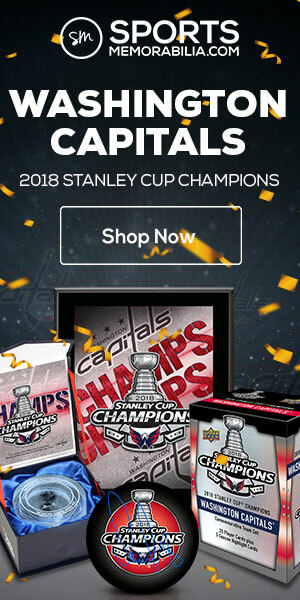 And who the hell buys baseball cards anymore? This card here may be the only time a U.S. President has appeared on a sports card, hockey or otherwise. 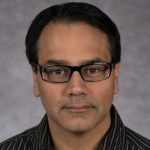 Previous Previous post: Thank you Martin!